The picture was taken in august 2006 at 4200 m altitude in Indian Himalaya. Fancy it? If yes, please read on. However, if this doesn't seem "self-sufficient" enough for you, you can stop reading and go directly to fullyloaded. Practically all touring cyclists seem to be weight conscious, both those who cannot survive without 40 kg of luggage, as others, who don't carry much more then a credit card. In my case, the philosophy behind the light weight style was inspired by frequent breakages of spokes on rear wheel. This happened on second hand bikes of questionable quality, but the idea of weight reduction survived up to today when broken spokes became a very distant, unpleasant memory. I am religiously convinced - which means without evidence - that little weight reduces the number of mechanical problems, decreases energy requirements and fatigue and increases average speed, distance and enjoyment of cycling. It probably decreases off-bike comfort, but it is not me who will point out the disadvantages. 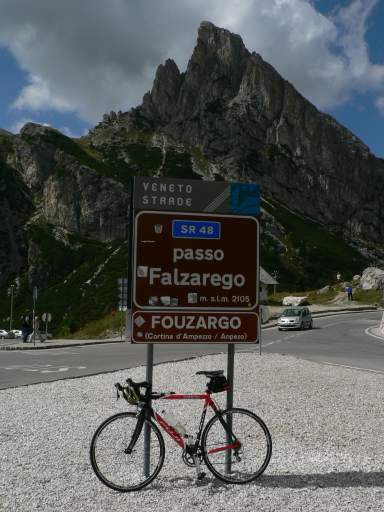 Earlier I wrote some thoughts about weight saving on one cycling forum. Then I made a web page which grew bigger and bigger and eventually got worldwide attention. It's now time to put it in proper format here. The content you will find here is written in sincere and true intention, but although people usually think I am cracked and extremist, I don't take this whole lightweight buisesness too seriously. I'd never let it interfere with the joy of pure cycling. Fortunately, I don't have to: light-weight and cycling stick perfectly together. Last update: 9.3.2018. See the list of updates in the Updates page. For the impatient ones, here is a summary of my current cycling set-up. I have an entry-level road bike (weighing a bit less than 10 kg), which has eyelets for rear rack. Tyres are rather narrow, 25-622 to 30-622. I use ordinary pedals and light sport shoes (no clipless shoes/pedals nor clips&straps), no second footware. I don't use cooking equipment. I carry my stuff in stuff bag on the rear rack and in a little bag (a converted saddle bag) on the handlebar. 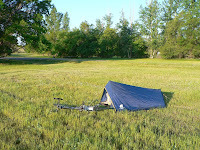 I use light single-skin tent (900 g) and down sleeping bag (600g or 900g, depending on the trip). My sleeping pad is a bubble-wrap strip, which I also use as wrapping material to make my stuff bag waterproof. Tools: 4,5&6 mm allen keys, pedal spanner (cut in half), 8/10 mm spanner, screwdriver, chain tool, spoke key, pump, tyre levers, (sometimes hypercracker). Separate tools are lighter then multitools. 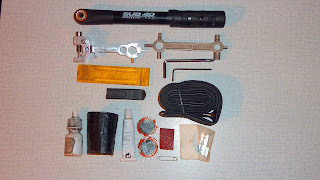 Spares: patch kit, 1 or 2 tubes, (sometimes spare tyre), oil, duct tape, (sometimes spare spokes). I stopped using maps. 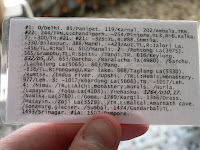 I now navigate by a small distance/directions card which I make before the trip. I have a compact ultrazoom digital camera, battery charger with shortened power cable and universal plug-ins. I use ordinary 1L or 1.5L plastic water bottles instead of cycling bidons, using ordinary (now carbon-fiber) bottle cages. I don't carry food, except some emergency food in extreme cases. I eat cold food bought in supermarkets (in western-type countries) or eat at cheap restaurants and markets in other countries. Toiletries: tooth brush and plastic dispensable razor (cut in half). Sometimes even tooth paste. I wear: cycling cap, gloves, jersey, shorts, arm warmers, light wind/rain shell, light sport shoes, light socks, (sometimes nylon stockings). Additional clothes (in the stuff bag/handlebar bag): light hiking trousers, light fleece top, beanie, spare socks, warm gloves, rain shell gloves, underwear, rain pants, overshoes. My touring weight (including everything except the bike, water and food, ie. also shoes, rack, ...) for a camping tour is from 5.5 kg to 7 kg, depending mostly on what kind of weather I expect. That can be reduced by about 300 g by using frame bags instead of rack, but for now I prefer the way I do it - it looks more elegant to me. Once you reduce the weight below 8 kg it is the volume and elegance that matters, not the weight. and - last but definitely not least - clothes. Bicycle. 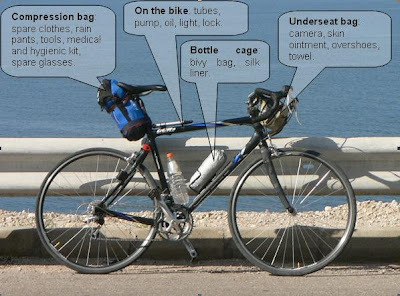 "Touring bicycle" is a term that was coined to accommodate the growing trend of cycling tourers which took too much stuff. The philosophy of a touring bicycle - take as much stuff as you want and we will build a bicycle that can handle that weight on any kind of roads - is just the opposite to the philosophy of an ultralighter. 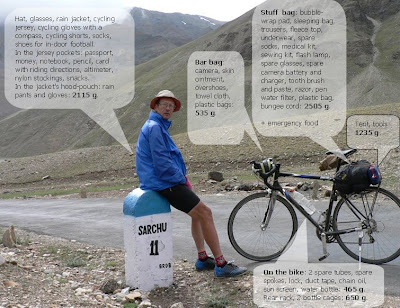 You can cycle-tour on rough terrain using very light bikes (for example less then 10 kg) if you can control your total luggage weight (all things except the bicycle) below 9 or 10 kg. I can't give you much advice on particular bikes, because I think there is no advice: any bike that can reliably carry your body weight should be able to carry the additional weight of ultralight luggage. OK, I might give you just one hint: a very light bike should be ridden more delicately - it is not a tank and you can't treat is as one. 2009, wild camping in Canada. ﻿Tent. The tent should not be heavier than 1500 grams. There are good tents weighing less than 1 kg. You don't need much tent space since you won't have a lot of luggage, so you can leave the tents with big vestibules, sheltered entrances, over-engineered guy lines etc. to your loaded comrades. I am personally quite happy with the single wall tents. There might be some minor problems with leakage and condensation, but these are rare occasions and not too hard to deal with. Your tent won't stay up in a tornado and you won't stay completely dry after 12 hours of tropical rain, but you probably wouldn't even if you had a 4-season tent. Extreme cases are better dealt with extreme measures - by taking shelter under a roof for example. Sleeping bag. Down sleeping bags are the way to go. They are warm, light and can be packed to small volume. 1 kg is a good starting estimate for a down bag for sleeping temperatures to -5 C, and extremes to -10 C with your warm clothes on. Sleeping pads. As a final step in the evolution of my sleeping kit I now have a body-sized strip of bubble-wrap as a sleeping pad (less than 100 grams). This might look too extreme, but I really don't remember being any more comfortable on a 5 mm foam pad that I had previously. As a great example of multiple use, the bubble wrap serves me also as a wrapping material to provide structure and waterproofness for my rear stuff bag. The bubbles don't pop or flatten that easily. You can have the same strip for 50++ nights. And by the time the bubbles flatten you will be trained - in the manner of great Asian martial artists - to sleep on hard packed ground without anything beneath. Cooking. No cooking utensils. I can survive on cold, dry food for a couple of days until I get to the restaurant or some other form of eatery. If the restaurant is expensive, I extend cold food treatment for another couple of days. I can't emphasize enough the importance of this: there's no cooker, no mugs, no pots, no plates, no cutlery, no fuel, no fuel container, no cleaning utensils, no bags for storing all this junk, no additional cooking water and no bags of raw, useless food. In addition, you don't waste your time in cooking, cleaning and searching for fuel and can concentrate on cycling instead. And there's a thing less to be broken. There are only two things I need from all these: a plastic tea spoon and a plastic toothpick (see the picture) - taken from the meal served on the plane. Both weigh about the resolution of my scale (2 g). I cary both in the back pocket of the cycling jersey - you never know when an opportunity for a good meal will come, so you better be prepared. Carriers. Don't underestimate the weight of carriers or 'containers'. These things, i.e. panniers, bags, backpacks, etc., are larpourlartistic inventions for storing other, presumably valuable, things. They are nevertheless necessary (unless the number of things that you are carrying is less then 4), so choose them so that the ratio of content weight to container weight is as high as possible, but not less then 3,142 (also known as 'pi'). Carriers deserve a post of their own - see the post below. Clothes (and shoes). Clothes as a colective item is one of the 7 big ones - in most cases the second big one, after the bike. So you should definitely take into good consideration what clothes you choose. Take a scale with you to the shop when you buy clothes. The people will laugh at you, for sure, but believe me - you will save a lot of money. The most expensive items are not always the best nor the lightest. Never take two items for the same purpose, e.g. two cycling shorts. The only possible exception to this rule is a spare pair of socks. Layering or comlementing items is a good thing to consider. A combination of a windbreaker + light rain shell is usually lighter and warmer then a single all-purpose rain/wind jacket. Arm warmers complemented with short sleaved jersey make a good subsitute for short and long sleeved jerseys. When one item is in the wash, slip into a complemenatry item while you wait it to dry (e.g. underwear + long trousers or rain pants when you wash your shorts). Wash your clothes in the evening so they dry by the morning. A case of special need of consideration are the shoes. For reasons explained elsewhere, I find special cycling shoes one of the most bizzare choises for a touring cyclist, especialy the lightweight-one. There are much lighter and more suitable alternatives. An excelent choice, that I used so far with great success, are the shoes for in-door football. These or similar low-tech trainers or light summer shoes can weigh down to 600 g for a pair. I am not against the combination of sandals and waterproof socks either. Right now I am experimenting with the "crocs" (340 g a pair). I generaly have two, complementary sets of clothing. 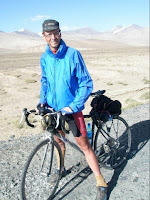 Usualy I wear: hat or cycling cap, wind/rain jacket, cycling gloves, cycling jersey, cycling shorts, socks and shoes. The complementary set: fleece cap (a beanie), fleece top, underwear (usually bathing trunks), trousers and second pair of socks is in the bag and comes into use on extremely cold days or nights, when off the bike or when the first set is in the wash. Other than that there are some additional items for the rain: rain pants, overshoes and gloves. I carry these in the hood pouch of the rain jacket - after I cut off the hood. Often I take a second T-shirt - sorry to disappoint you, everybody makes compromises sometime. I think a word of warning is in order here: beware, lightweight touring can be addictive! Which means that like a drug addict you may start spending more and more money on lighter and lighter equipment. I'm maybe not the right person to give advice, since I already went too far, but to avoid this I suggest to set yourself a goal, but also a limit. For example, your goal may be to lighten your luggage to 8 kg. Then I suggest to make your "virtual set-up". This means that you first make a list of all the items you need. Then search the net for the best, albeit the most expensive equipment that will be within your limit. When doing this virtual set-up make sure that the items in your list are both compatible (for ex. that your handlebar bag is big enough to store your camera) and that there is no redundancy. This is an iterative prosess. You'll have to go few time through it, if you want to optimize things in weight, in price and in suitability. At least that's what I would do if I started from scratch. And If I had patience. If you are certain that you won't go below the limit, you'll never be sorry even if you buy the most expensive stuff. If, on the other hand, you are most likely to improve your equipment permanently, then I guess the best way is to buy the cheapest stuff. Panniers are by far the most common bicycle carrier. But, I don't use them, and if you are serious about weight saving, they are the first thing to abandon. By doing so you'll probably get rid of a heavy rack too. Here are some alternatives that I'd recommend. Backpacks. Based on the previous axiom (content to container weight), I'd chosen a backpack instead of panniers as my primary container (picture below). A backpack (stripped of unnecessary straps and belts), together with a bungee cord or two, is lighter than any pannier(s) of the same capacity. For example, my 40 l backpack was 1120 g, and is now 820 g after I cut off the waist belt and removed few other appendices. For comparison, if you take 2 Ortlieb 'Back Roller' panniers, the capacity is the same, 40 l, the weight is almost twice as much, 1630 g (data taken from Ortlieb website). Besides the weight argument, backpack is excellent for hiking and site-seeing and very appropriate when carrying your bike and stuff for larger distances (across river, mud, sand, stairs and other obstacles). The excellent thing about it is that it has no mounting system that can (and eventually will) break. It fits on any type of rack, never gets into the spokes, doesn't bounce while riding and has no issue of 'heel clearance'. It never gets wet in river fording, and even if the rack fails it isn't the end of cycling - you can still pedal to the next repair shop with your luggage on your back. One additional advantage, which, to be honest, I haven't fully proven, is the possibility to reduce the aerodynamic drag if you position your backpack lengthwise on the rack. Backpacks have so many advantages that one wonders why so few people use this setup. My answer is: they are effective only if they are reasonably small - which brings us back to weight and volume reduction. I use a 40 liter backpack with internal aluminum frame - it is important that a backpack is rigid and doesn't hang over the rack. Don't ever carry the backpack on your back while cycling. P.s. Nowdays I don't use backpacks - I found much lighter alternatives. See stuff-sack setup below. Waterproof bag. An even lighter alternative to the backpack is a waterproof stuff-sack/bag. My waterproof bag is almost one half of the weight of the backpack of the came capacity (40 l). The bag has additional advantage of waterproofness, but, alas, is not appropriate for hiking and, also, items inside are not as quickly accessible. Nevertheless, for a pure cycling trip, it's ideal in my opinion. Stuff sack. Just when I thought I can't go any lighter, I discovered another option. 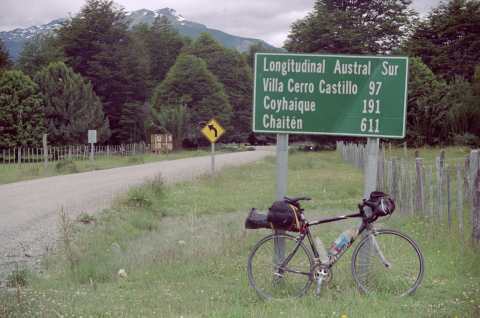 On the South American tour I used a very light stuff sack (160 g) tied to rear rack together with a tent (2 photos at the right). Instead of foam sleeping mat I had a strip of bubble-wrap; this reduced volume significantly and beside that I could wrap all my things in bubble-wrap and put the bundle in the stuff sack, making it practically waterproof. It worked wonderfully and it's going to be the standard from now on. When I decide to replace the big SLR camera with a tiny digital one, I think I'll be able to get rid of the handlebar-bag too. Front and rear. I use both front and rear containers. The original reason for this was the possibility to transfer weight between rear and front in case of damaged wheel. It is a kind of anachronism nowadays, when I don't have enough weight to cause the damage, but I still carry a handlebar bag mostly to store frequently used objects such as camera. It goes without saying that this bag fulfills the ratio condition mentioned above. Credit card touring. You can go far lighter then that if you never intend to camp. "Credit card touring" is not my preference, but if you fancy it, as an illustration, see the pictures from my short 1-week tours in the Alps (first, second). Not having camping equipment reduces the bulk of things so much, that you suddenly enter the miraculous circle of weight reduction - you have so little that you don't need any kind of racks. All the things can be supported by bicycle frame. On those credit-card (i.e. no-camping) tours I carried camera, overshoes, towel and skin ointment in a small handlebar bag (a modified middle-sized underseat bag) and other items like spare clothes, spare glasses, tools, etc in a bag behind the seat. The brevet style. Riding in a brevet (or "randonneur") style, over the whole 24 hours, opens new possibilities. These kind of rides usually involve a few short sleep stops (“power sleep”) and they do not require camping equipment. This greatly reduces the amount of luggage without any restrictions about riding longer distances or finding a place to sleep. From my experience, two to four instances of 30 to 45 minutes of sleep is all you need in 24 hours. You can crash in anywhere: in a designated rest area, on a bench of a bus stop, on a petrol station, in the forest or just by the side of the road. On a longer tour (about a month or so) you probably wouldn't ride this way on a day-to-day basis. But you could mix 24h or 48h riding with shorter episodes, staying in hotels every second or third day – reducing overall costs. For further detail look at "Lessons learned from brevets" in the "News" page. Bivy bag. The set up for a credit car tour can be extended to include emergency camping in a bivy bag. 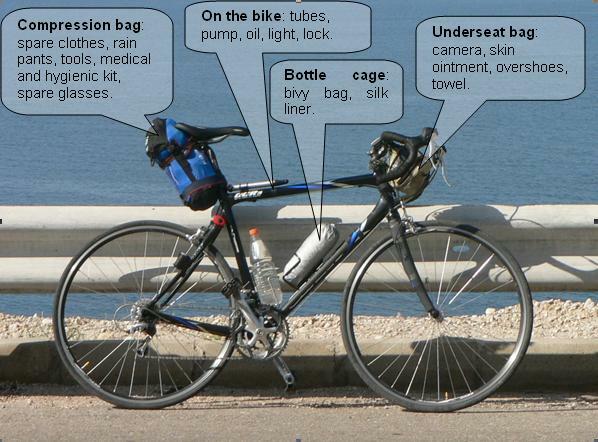 I tested this approach on a 2-week winter tour in Jordan and Israel. The setup is pictured and explained on the following photo - below you will find also a kit list. I carried bivy bag and silk sleeping liner in the second bottle cage. Spare clothes, tools and few other miscellaneous items perfectly fitted in the compression bag which was secured behind the seat with two straps. Camera and few other minorities, as usual, was in the small under-seat bag on the handlebar. The spare tube was taped to the head tube. Thus, there was no need for a rack. In all it was 4 kg less from my usual "camping" setup. This can be viewed as a middle ground between full tour with camping and credit-card touring. To be honest, the bivy bag didn't work very well in the Middle East's winter, even though I slept outside only twice in rather balmy weather near the Dead sea. The night temperatures (5 to 8 deg C) were too low. But, with the addition of light ground sheet (a bubble wrap for example), I think this approach would work well for summer tours (with night temperatures above 10 C) in regions with good roads and frequent accommodation possibilities or in counties where camping is not easy. There are quite some parts of the world that would fit in: SE Asia, India, parts of China, Europe, North America. 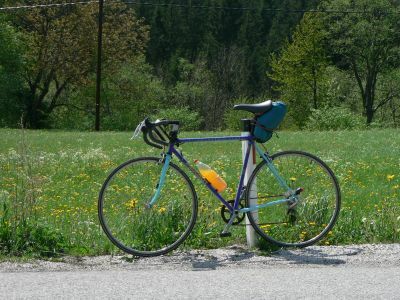 A similar setup (with a smaller handlebar bag) was used in France in 2011, when I rode across 100 cols- take a look at the picture below and on the Equipment reviews page for more detail. France 2011: 3 kg of luggage and 8.9 kg road bike. Sleeping bag. Much better alternative for a bivvy bag is a light (summer) sleeping bag. 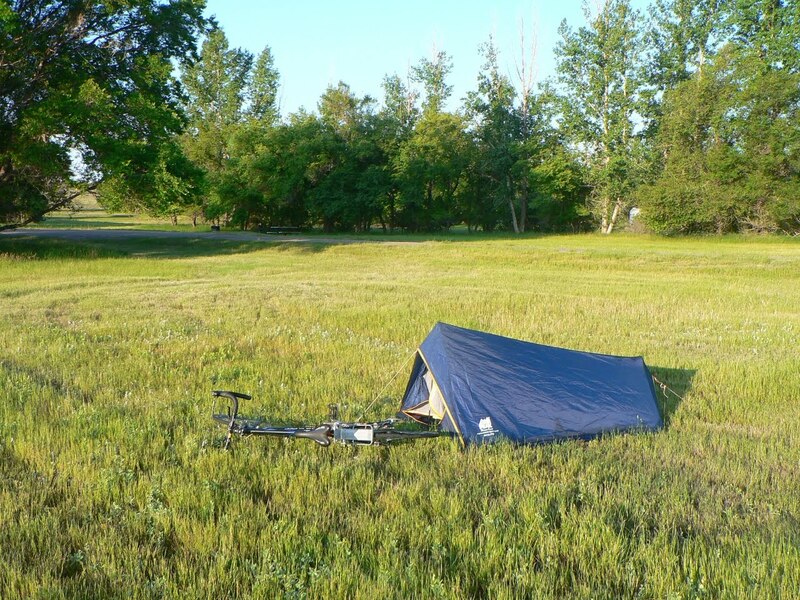 With the setup like that you can make a camping tour with a light road bike and so little luggage that people will think you're on a day tour. 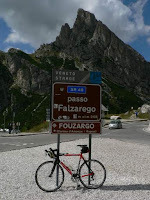 This is the approach from my second visit in France for the "200 cols tour" (the detailed packing list is there). France 2012: 2.6 kg of luggage and 7.3 kg road bike. Together: 9.9 kg. The setup for this tour is shown in the picture above. The carrier behind the seat is a compression bag for a 3-season sleeping bag. There is a much smaller summer down sleeping bag in it (472 g), a nylon sheet (34 g), off-bike shorts and some other smaller items. To reduce the contact of the bag with my thighs, I tied a plastic bracket (10 g) to the back of the seatpost as a spacer. Rain jacket and arm warmers are in the grey bag in the second bottle cage. A small camera bag (40 g) is tied to the handlebar, containing camera, tools, ointment, and reflective belts for night riding. Spare tube and lock are tied around the head tube. There is also front and rear light. "Ultralight camp" on French tour 2012. Rack or no rack. If you came this far in reducing your weight, you'll probably ask yourself the ultimate question: do I need a bicycle rack at all. 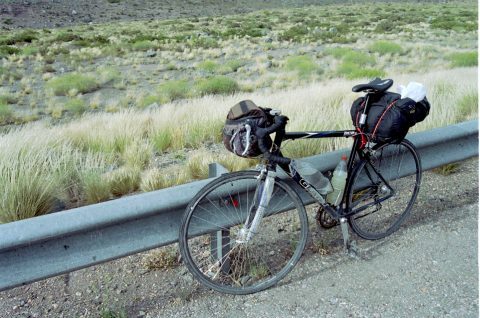 There exists an aversion against racks, maybe even derision, among top ultralight cyclists. The alternative is to carry your luggage in underseat bag, handlebar and/or frame bags, which attach directly to the bike. But is this really a big step forward? With regard to weight, the frame bags are probably winners - although just tightly. On the other hand, with a small, light rear rack without unnecessary struts weighing 400 grams including the mounting hardware (the rack in the photo is 414 g - it's listed as front rack, but I use it as rear rack), 30 L stuff sack (130 g) and a bungee cord (70 g) you've got yourself a versatile and simple carrying system of 600 grams, that will flawlessly carry most of your stuff including a tent, sleeping bag, sleeping pad and set of warm clothes. I don't believe any reasonably sized single frame bag is big enough for that, and any two bags will struggle to keep their weight withing the 600 grams. Also, a big frame bag will probably be more unstable (or will need much stronger (=heavier) attachments) then if it's bungeed to the rack. Then there is a question of elegance. You haven't gone this far reducing your luggage and scarifying your comfort (so they say), just to end up with amorphous black blots covering your bike all over. If you don't believe my words, just look at the picture above, showing my bike on the Middle East tour. It doesn't have a rack, but is stained all over with bits of stuff strapped here and there. And, last but not least, it's so simple to bungee anything on the rack - a rain jacket for example when the weather is changeable and you take if of and on all the time. This is not to say I am against frame bags, or that I will not experiment in that direction, but for now, until the world came up with something more elegant and innovative, I prefer the versatility of a small and light rear rack - at least for full-kit camping tours. (See also "Racks" in Equipment Reviews page). Books. No books! Paper is extremely heavy with respect to its usefulness. Read your tourist guide before the trip and leave it at home. The only thing that I need from a guidebook on the trip are maps of towns. I photocopy these or tear them off the guide - there is no place for sentimentality here. On a long trip it is sometimes nice to have something to read. When this mood hits me, I stay a day or two in some hostel where they have books to lend. Digital cameras. I'm not an expert in digital photography and am a classical fan myself, but from the volume/weight point of view I'd reccommend the use of digital cameras. Old style SLR film cameras are 3-6 times heavier than digital ones. The spare batteries/charger that you'll need for digital cameras are in the weight class of spare films for SLRs. You are looking at about 500 g of saving here, minimum, not to mention the volume. 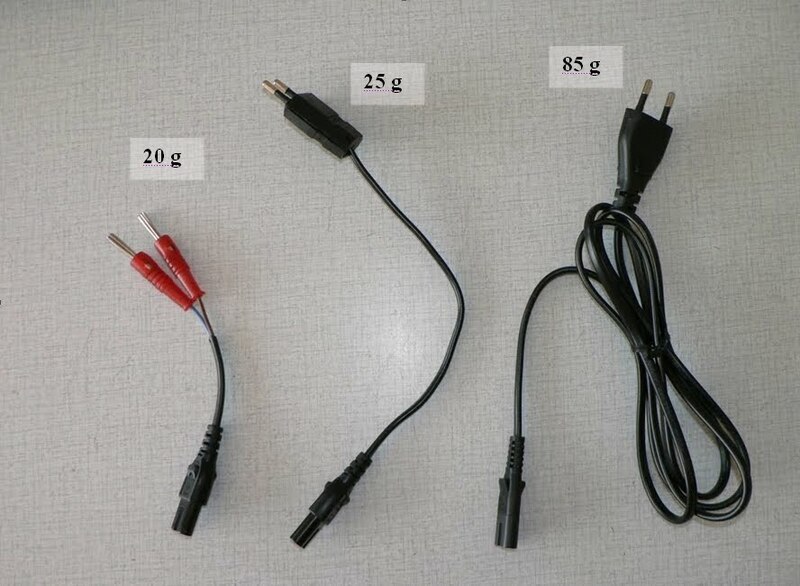 On the picture to the left you'll see also an evolution of a baterry recharging cable, the leftmost one can be used on any kind of plugs. P.S. I wrote this paragraph few years ago and now it is obsolete: nobody uses film cameras any more. However, you can read it as "compact versus DSLR" musing. With regard to weight and bulk DSLRs are a huge step backward from compact cameras. And to those of you why prefer the DSLRs because of their superior picture quality, I say: tell me that when you make your first poster print or publish an article in National Geographics. Locks. My philosophy for securing the bike is to have it always in sight. 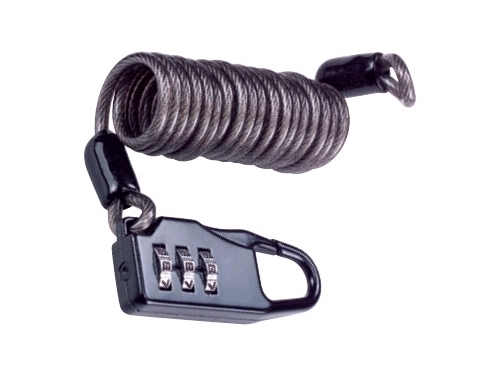 On few occasions when it is not possible, I lock it with the small cable lock to a solid object - and hope for the best. I assume that any kind of lock can be broken, so you might as well have the smallest and lightest lock, just to prevent any passer-by taking your bike. As you can see on the picture I use now a small cable with combination lock (48 g). The cable is just thick enought that you can't break it with your teeth - unless you are a character from James Bond movies. This means that you'll need a tool to break the lock. But if you are determined to steal the bike to the point that you brought the tool, then you'll break any kind of lock. Cycling jersey. Make a good use of cycling jersey's pockets. They are ideal carriers: light, aerodinamic, accessible on the fly. You can store 200 to 300 grams there - possibly everything you need while riding on an average day. Some additional stuff can be tucked under the leggings of cycling shorts. Bicycle frame. Lot of stuff can be taped on various parts of the frame. I usualy tape less frequently used items to the frame: spare tubes, spare tyre, spare spokes, canisters with oil and sun screen, duckt tape, pump, light, lock. This reduces the stress on the racks a bit and more importantly reduces the volume of your stuff bags, so you may end up by using smaller stuff bags in the end. Cockpit. Here is a picture of my cockpit with the underseat bag used on handlebar. There are several interesting things here. 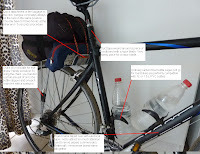 The underseat bag is attached to the handlebar with three velcro straps (two at the top are seen). The handles of the bag zippers are replaced by pieces of (blue) fabric - this might have saved 0,5 grams, more importantly this eliminates the rattle of the zipper handles. The spare tube is taped to the head tube. A small cable lock (48 g) is put around the spare tube and serves as a protection against the fricton on the bag-to-spare tube interface. On rough roads this friction will puncture your spare tube if not protected! The mirror is on the inside, so the bike can be leaned against the wall or layed down freely. The computer is on the stem, so that it doesn't take up precious space on the handlebar. Additional brake levers could have been removed, they are usually not used much. They are, however, useful on long or steep dowhills, especially on gravel, when they provide additional position to prevent fingers becoming numb from braking. Maps. Cut your maps and leave parts that are not on your itinerary. You can save up to 150 grams, an amazing amount for a single object. Again, no sentimentality here - train your relentlessness, you'll need it on a trip. Digital maps / cue sheets. In my recent trips (India, Alps, Australia, ...) I experimented a bit with a "no-map" approach. What I did was to make notes of the towns, directions, distances and road numbers, all on a small card (10x6 cm) which I plastified and wore in the back pocket of the cycling jersey. It saved me a little weight (~50 g), but the main benefit was that I didn't need big handlebarbag to store the map. I also was not distracted by taking out, unfolding, looking at, folding and storing back the map, and that probably gave me advantage of a few kms per day. This approach really works for me and I don't think I'll be taking maps any more. But what really surprized me was the fact that I didn't use the card too much either - it looks like that one can comfortably cycle around the world without any kind of map or navigation tool, other than the knowledge of few town names. See "Digital Maps" for more detail. The plastified cue sheet can be used as a tool too - for example to scrap off the ice from the tent walls. Water bottles. Cycling water bottles - what a waste. They weigh 70 to 100 grams and give you at most 0,75 l volume. Throw them away and use plastic bottles, 1L or 1,5L (weight less than 50 g). You may not need the second bottle cage (another 80 g saved) or, alternatively, cut the second plastic water bottle in half, and use it as a very light and waterproof container for assorted items. Some of the 1L PVC bottles are particulary resistent to wear. One particular bottle is lasting me 3 tours now - so long that it became my pet. Contrary to popular belief, you don't need special, long bottle cages for 1L or 1.5L bottles. Ordinary road-bicyles' alu or even carbon fiber cages are perfectly OK. Camera film container. Use plastic boxes for camera film as a container for liquid or loose objects such as tooth paste, sun screen, detergent, chain oil, grease, bolts and nuts. The box weighs 5 grams, less than any original container. Besides, you don't need the whole tube of chain oil or tooth paste for one month, do you? Dish washing cloth. Take dish washing cloth (chamois) instead of a towel. It's another ~50 grams saved. Wrap it around wet clothes and sqeeze to dry them. It is also usefull for wiping the condesation from the inside of your small tent in the morning and refreshing your face with it afterwards. We don't use big tents with vestibules and other luxuries here - a tent heavier than 1500 grams is out of the question! Nylon stockings. Use women's nylon stockings (cut, of course) as arm or leg warmers and save on a long cycling trousers - an enormous weight and space saving. Don't let prejudice interfere with your principles. If there's not a trace of transvestite in you, wear them under regular trousers or rain pants. They are usefull as sun-screen for the arms and legs too: you can forget about that mix of sweat, sun-screen and dirt on your body, that you were so proud of during your "self-sufficient" stage. Tools & spares - Canada, 2009. Tools and spares. The amount of these depend on particular destination. The "core" tools are: pump, 2 tyre levers, 2, 4, 5 and 6 mm allen keys, spoke key, 2 razor blades, small flat screwdriver and 15 mm pedal spanner (cut in half). The "core" spares are patch kit, 1 spare tube, about 1 m of duckt tape and a little bottle (or a film canister) with a bit of chain oil. This core weighs about 300 grams (picture). I'd take only core tools and spares on a tour lasting up to a week or even more if I travel in an area with high density of good bike shops (e.g. Europe, North America). Additional tools and spares for any type of tour are: chain tool, a bit more of duck tape, few zip-ties, second spare tube and emergency spoke (170 grams). I take a hypercracker, 2 spare spokes and spare tyre when I expect very tough roads in very remote areas (220 grams). So far this worked well for me. I don't take tools for major repairs such as hub, bottom bracket or derailleur repair, as my experience teaches me that I have marginal probablity of using them. The same goes for brake and gear cables and I even find spare brake shoes unnecessary, since they wear down so slowly (same 2 pairs for 16000 km now). If anything happens to my bike that I could fix if I had the tool, I am positive I'd be able to improvise and (slowly) cycle to the first bicycle/hardware repair store anywhere in the world to get it fixed. Tools & spares - Vietnam/China 2013. 100 g lighter then the kit from 2009. I'd advise against using multitools: they are heavier then wisely selected separate tools, many of their parts are never used (or useless) or are awkward to use. (I changed the mind about multitools; some may be good: see the discussion in Equipment reviews page /Tools). If you can, modify the bolts and nuts on your bike so that you need as little different tools as possible. I'd also strongly advise to educate yourself as much as possible in bicycle repair. If you know how things work it's easier to improvise. The list of the tasks (in order of importance) that I had to deal with on tours is: adjusting handlebar and sadle position, replacing pedals, fixing a flat, cleaning and oiling the chain, adjusting derailers, adjusting brakes, truing the wheel, replacing a spoke on the drive side of the rear wheel, adjusting the headset, building the wheel from scratch with just a spoke key, making a tyre boot. In addition, you may find instructive if you tried: changing the cables, adjusting hubs, changing the bottom bracket. See the Sheldon Brown's site for the procedures. As a curiosity: I had to go to the repair shop (other then to borrow a tool) only once so far - and even then the problem did not happen during the ride: my bike fell off the speeding bus. Knock on wood! Lightening the bike. Once you've cut down your gear to roughly 8 kg, it's time to start thinking about lightening your bike. Saving weight on components is quite expensive thing. If you buy completely new bike it's roughly 100 EUR per 100 grams less. It easy to remember: 1 gram less = 1 Euro. Buying components separately would mean even more. So, I suggest to change to lighter components when old ones wear down or are not adequate. Some hints: Get a lighter rear rack. Since you have little load, you don't need heavy duty racks. This is relatively cheap and could save you up to 200 g. If you don't use panniers (as I reccommend), you can saw off the unnecessary rack struts whose only function is to keep the pannier from hitting the spokes. Get a shorter seat post - or cut the old one. Narrower tyres. Folding kevlar beaded tyres instead of wire-beaded ones (up to 100 g less for 2). Replace quick-release skewers with allen-key ones, it may save you up to 100 g. Lighter front wheel: the original front wheel is usually the same as rear one, but is far less stressed. If you can, modify the bolts and nuts on your bike so that you need as little different tools as possible. The big opportunity for weight saving comes when you decide to buy a new bike. There are essentially two approaches: either you decide to build your bike from the components you choose (custom made bike) or to buy off-the-peg bike. Custom made bikes will probably be optimal for the intended purpose, but also much more expensive. I am inclined toward the second option. My choice would probably be a light weight aluminuim road bike with compact double 50/34 crankset. You could get a bike like that, with 10 speed 12-28 cassette (lowest gear ratio 34/28=1,21) and Ultegra or 105 group, weighing 8 kg, for 1000 to 1300 Euros. The main thing to look for is that it has tire clearance for (at least) 28 mm tires. I'd change the cassete to include 30 or 32 biggest cog, so that the lowest gear ratio is 34/30=1,13 or 34/32=1,06, both of it being lower than my current 30/26=1,15. I'd run it with 8-speed chain, since it requires less maintenance. I'd also need adapters to fix the rear rack to the axle. If you are really crazy about weight saving, you might change the big ring with something like 48 or 46, remove the front derailleur and shifter cables and replace front shifter/brake combo with front brake. You will then use mostly the big ring, and shift to the small ring with your hand or foot only on steep hills. That's what the Cranes did when they rode across Tibet two decades ago. Or you may buy a 6,5 kg CF bike with Dura Ace and ride with 22-622 tires. Anything is possible. Little tricks. One of the side benefits out of the ultralight weight cycling is the fact that you start to think how the things work, or how to improve them. You will start experimenting, and apart from keeping your brain bussy, you'll most likely come up with some minor or major solutions that you'll be proud of. The picture shows a few minor tricks which I like, even though I won't get a Nobel prize for them. Money. How much do you spend on a tour? Do you spend much more if you tour in a ultralight style? 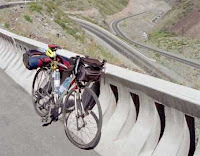 It seems that touring cyclists – particularly the »self-sufficient« kind – often perceive ultralight cycle-touring as quite expensive. They may be right. I don't know what their costs are, so I can't compare. Cooking your own food is probably marginally cheaper (if at all) then buying food form supermarkets. Camping reduces costs considerably. But you don't cook all the time and you don't camp all the time, no mater if you are ultralight or ultraheavy. On the other hand, heavily loaded tourist is usually slower, so needs more days to reach the destination and this costs more. They might be other arguments for and against. The amount of money spent on a tour is a highly sought subject - too bad people shy to reveal it. I kept records of my costs on tours, and they are explained in detail on the particular tour report on my original web site. Here I give a summary, so you can decide for yourself if I spend much or not. The presented costs don't include transportation costs to/from start/end of the tour or any other costs before departing day. Costs are calculated from the difference of the money I had on the departing day to the money on the returning day. If these costs look like too much for you, note that I'm not the stingiest of cyclists. I won’t spend too much time looking for the absolutely cheapest option, I don’t seek free service from the locals, I like comfort of a hotel room from time to time, coffee in the morning, I won't say no to a beer or two and before 2011 I even smoked cigarettes on the last weeks of the tour. Improvisation. Take only the things that you need indispensably. Imagine an average day of cycling and go mentally through the daily procedures and the things needed. Don't concentrate on too many accidental events. If they happen - and these are low probability events by definition - count on improvisation and help or paid service from the local people. Rain. Rain is a special subject which I will research in deeper detail in the years that will follow. So, unfortunately, I can't give you much useful advice now. Come back here in about a year's time and you'll hear the words of an old wise man. For now, based especially on my last trip through rainy North America, I only know that nothing that I tried so far, works well. I tried all sorts of jackets, pants, breathables and unbreathables, overshoes, even tyvec suit for nuclear power-plant workers, and I still haven't find the solution. Well, maybe one - and a very lightweight indeed: just grin and bear it. If I am doomed to be wet I might as well do it with less/lighter gear. Who knows, maybe the best way is to ride naked through the rain, having your dry clothes ready tucked away in your bag. Update. Well, I am a few years older now, and maybe a bit more experienced. I'm still in a pursuit for the magic rain-formula, but meanwhile I've come up with few minor solutions. First, you'll have to realize that - no matter what you wear or don't wear - you will be wet when riding in the rain. Once you come to terms with that, world will be much nicer. Starting from the head: cycling cap is a perfect headwear (in rain or sun): protects from the rain, restricts the heat loss from the head, brim stops the spray. I now prefer a light water repelling (or "resistant") top instead of full rainproof jacket, because it's lighter, packs smaller, can be used in wider range of circumstances (cold mornings, wind, descent) and has less condensation. Idealy it would come with armpit mesh for ventilation. Under that I wear a cycling top (a jersey) and thermal arm warmers. Plastic gloves (the kind you get in petrol stations or in fruit-departments in supermarkets) are surprisingly useful in rain - just slide them over your cycling gloves. Too bad they don't make XXL versions. Even better are gloves made from a plastic cover of a magazine: see instructions here. I prefer not to wear any kind of rain protection for the legs. Feet: wrap them in cling foil. A hint about the cling foil: cut it in half so that it has the width of a bandage, that way it's much more practical. To reduce the spray to your back side (unless you have a mudguard) you can make a "tail" out of a plastic bag and hang it from your waist. All this is sufficient for more or less mild rain conditions. If the temperature is low or the ride is long, keeping dry may be the only reasonable solution - that might mean to stop cycling. Toiletries & medicines, 2009, Canada. Washing. In everyday, non-cycling life I don't use much toiletries; water, soap and tooth paste do it for me. So it's easy for me to give up on them on a cycling tour. Beside that I like to cycle alone and I am free of any social restraints, including body odor. If people don't like the way you smell, whose problem is it anyway: yours or theirs? I do like to shower or wash at the end of the ride, but if there is no such possibility, it's no disaster: I know the sweat will dry out in an hour, leaving the dry, crisp layer of salt that I lick off and replenish the electrolytes that were lost. I used to carry liquid detergent and tooth paste in film boxes taped to the bicycle, but stopped doing so after I realized the pure water is enough to make me feel fresh and clean (even for shaving and brushing teeth). Sooner or later I come upon a camp or a hotel where they have some stronger chemical stuff for more radical treatment. I don't know what is my days-without-shower record, but it's certainly nothing special compared to some "self-sufficient" stories. On the other hand, it pays off to wash your stuff. The dirt, sweat and dust collect in the tissue and make clothing up to 10% heavier. Or even more. My old bubble wrap sleeping pad (which I never washed) is almost twice heavier than the new pad of the same dimension (135g vs 72g). Of course, the same applies when you wash yourself. I'm still not sure why I feel good after a wash: because I am clean or because I am lighter? The picture shows my toiletries+medical+sawing kit: thread with a needle, razor blades, a roll of white medical tape (wrapped around a piece of cork), a couple of aspirins wrapped in a piece of plaster (plaster not being necessay if you have the white medical tape), 3 vitamin pils (not necessary), two shaving razors and a tooth brush. Cutting. Cut, cut, cut. The things produced nowadays - apart from those made for TdF racers - are redundantly designed. Cut your shirts, tear off buttons, straps, collars and not needed pockets. You will save few 100 grams, you will learn how the things work and will develope an eye for ridiculously redundant equipment. If you are creative enough, you may start making your own stuff. It is well known truth that the only equipment that fulfills all your requirements is the one you make - or at least modify - yourself. Number of things. An equally important point to weight/volume is a number of things. The more things you have, the more time it takes to pack them and to find them - and there is more probability you'll loose them. The ideal would be not to take some things at all - I got rid of stoves and books in this way. There is a deffinite beauty and elegance in traveling in minimalistic style. Alternatively, use the same thing for multiple purposes as much as possible. Bubble wrap used as a sleeping pad as well as for water-proofing or cue sheet used also as a scrapping spade are good examples, but I can't really give you much more advice here - obviously this is a promising field that needs much more research. Adding up. Little weight and volume savings add up. For example: on the australian tour I had the smallest and lightest pack so far, below 6000 grams, even though I had a helmet (280 g) which I usualy don't wear. About 700 grams lighter pack compared to the one on Indian trip came from little changes: lighter rain jacket, ommision of batery charger, lighter lock, only one spare tube, razor blade instead of a knife, cutting the pedal wrench in half, shorter socks, ommision of tooth paste, smaller medical & sewing kit, cutting the handles of a razor and toot bruch, less pages in a notebook, etc. Some modifications to the bike were made too: I cut part of the seatpost and removed the kick stand. Mountains. Do you like riding in mountains? Have you wondered why is riding in mountains much slower then on flat ground? Well, it must be connected to weight somehow. See the miscellaneous bicycle wisdom page for an explanation. Monitoring. Once on the road, monitor the frequency of the use of various objects. The ones you use infrequently are the candidates for omission on the next trip. The ultralight Zen. At the end let me address the usual, fully loaded way of touring. My intention is not to convert anyone to either light- or loaded- or any other way of touring. This site is ment to provide some ideas for those who are willing to sacrifice some comfort for a lighter pack. There seems to be an oppinion that by doing so one sacrifies also one's 'freedom', 'independence' or 'self-sufficiency'. I don't share this view - let me end with a bit of Zen-touch: the true freedom is in having less.